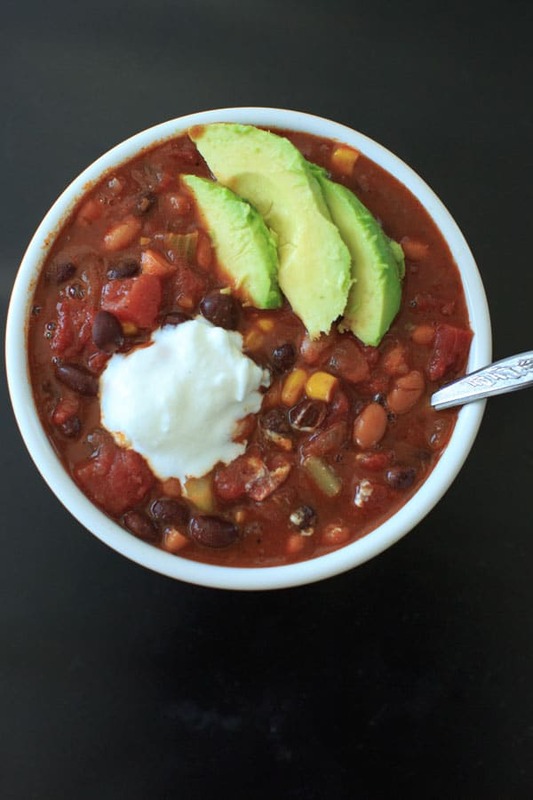 Vegetarian chili that’s also vegan friendly and gluten-free. 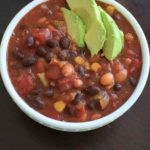 This one pot meal can be ready in 30 minutes and is deliciously flavored with McCormick Organics Chili Seasoning. I’m baaaack with another one-pot meal. Summer is coming to a close soon and back to school season is upon us. Even though back-to-school doesn’t apply to me anymore (or yet, depending on how you look at it), it’s generally a busier time of year as vacations wind down and schedules get full. Saving time (and dishes!) is always a good plan regardless. I sometimes (most of the time) just want to skip ahead to the next thing, including seasons. I start to wear sweatshirts while it’s still hot and shorts when it’s cold, as if that will somehow change the weather on its own. This year though, I’m so ready for cooler weather. So it’s no surprise I’m already cooking comfort foods. 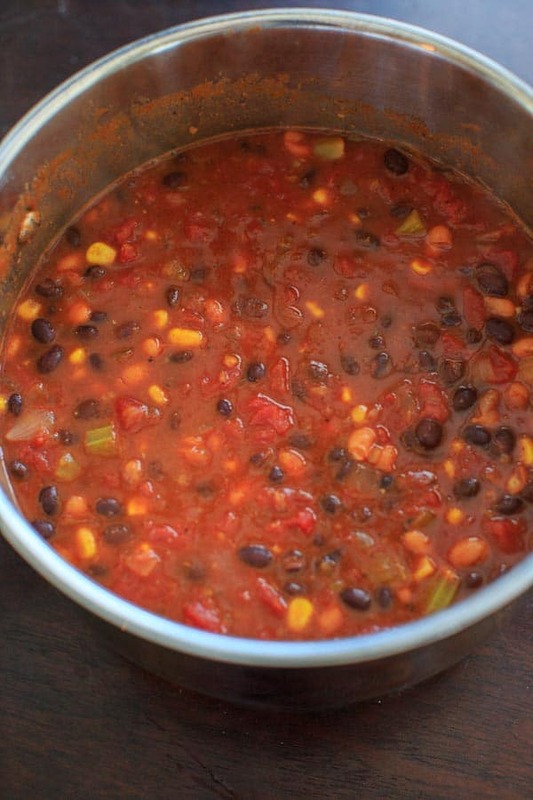 And luckily I’ve found my new favorite one-pot meal to stay warm: this bean vegetarian chili. 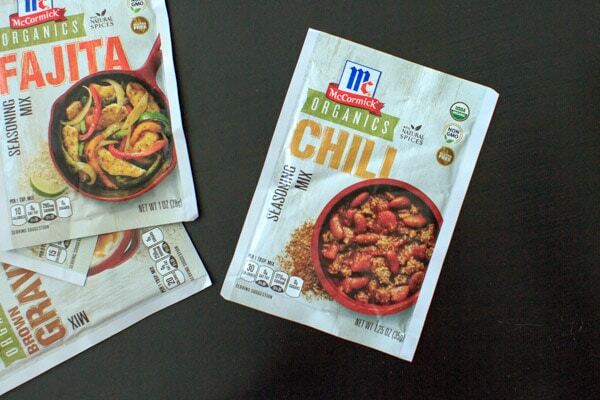 Also lucky: McCormick is making dinner prep even easier with their new McCormick Organics seasoning mixes. There are four varieties: Brown Gravy Mix (FYI: that one’s not vegetarian), Taco Seasoning Mix, Fajita Seasoning Mix and Chili Seasoning Mix. They have all the spices you need to flavor the one-pot meal of your choice in one convenient package. And to top if off, they are all certified organic and non-GMO. The Organics Chili seasoning mix for this recipe includes chili pepper, cumin, oregano, long grain white rice flour, onion, salt and garlic. You just need to cut up an onion and some celery, and then pretty much dump everything else in. My kind of dinner! Since nothing really has to “cook” here (like in meat chili) the cooking time is mostly to heat it up and meld all the flavors together. Though a 30-minute meal, you can let it simmer for longer if you prefer to let the flavors integrate more. Top it off with your favorite chili toppings! I like avocado. Sour cream (or greek yogurt) is also a good option if you aren’t trying to keep it vegan. So really, you can’t beat this dinner in terms of time to get a wholesome delicious meal on the table. 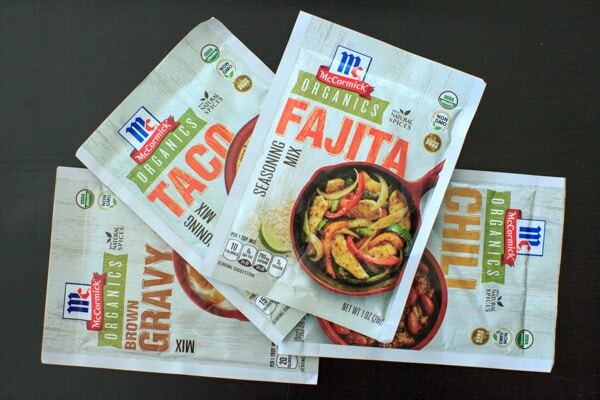 Be sure to check out the McCormick site to check out all their organic seasoning mixes. 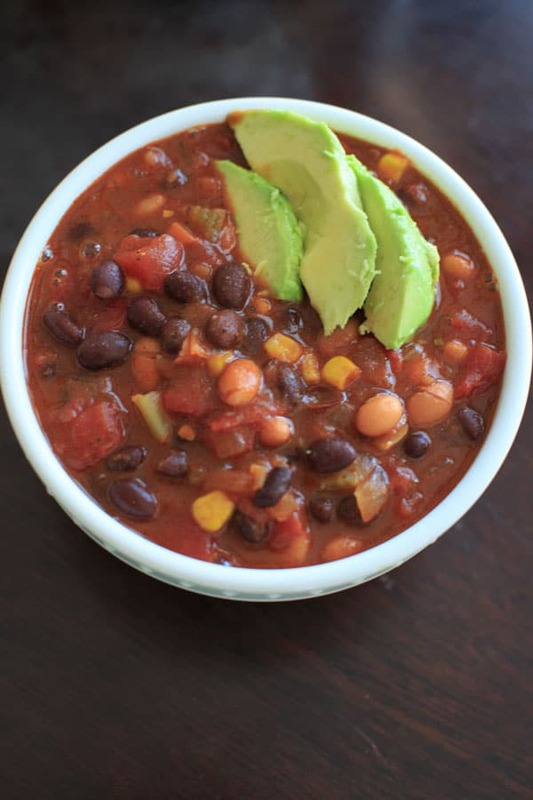 Vegetarian chili that's also vegan friendly and gluten-free. 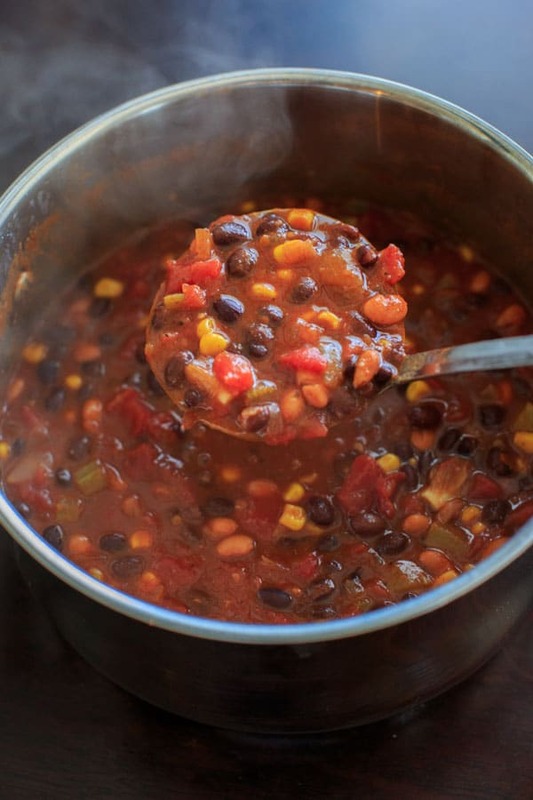 This one pot meal can be ready in 30 minutes and is deliciously flavored with McCormick Organics Chili Seasoning. In a large pot, heat olive oil over medium heat. Add onion and celery and stir for 3 minutes, or until onion is translucent. Add diced tomatoes (with their juices), beans, corn, and vegetable broth. Stir in lime juice and seasoning mix and bring to a low boil. Since nothing really has to "cook" here (like in meat chili) the cooking time is mostly to heat it up and meld all the flavors together. It's a 30-minute meal, but you can let it simmer for longer if you prefer to let the flavors integrate more. Been making this chilli for a while now! Husband and my daughter LOVES it! !